The US Coast Guard Military Tribute 'Thrasos with Body Shield' Custom OWB Holster is designed and crafted by Soteria Leather. 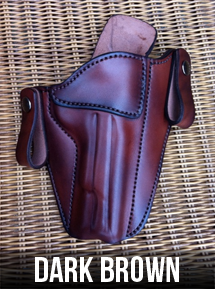 The Thrasos is a favorite handgun holster because of the holster belt straps and the body shield comfort. The US Coast Guard holster features the Coast Guard's crest and thread colors of red and white. "The story of America's quest for freedom is inscribed on her history in the blood of her patriots." The straps that wrap around your gun belt are small, but durable. This feature ensures that your concealed gun will not be seen. A loose outer garment, a t-shirt or a jacket, is all you will need for handgun concealment. The body shield covers the back of the handgun, the hammer, and the back sight. 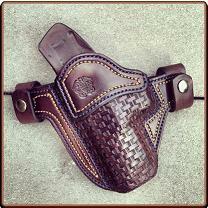 The body shield is a good option if you are wearing a garment that you do not want the concealed gun to rub against. The Name: Thrasos was the "Spirit of Boldness" in Greek Mythology. 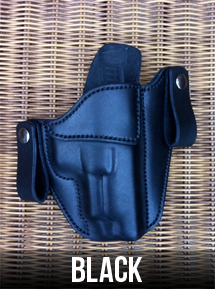 This concealed carry holster is available for the following weapons. NOTE: If you do not see your handgun listed in the Weapon Option List, please send us an email -- it may be available, or available soon. Kimber SOLO, 1911 3", 1911 4"
Ruger GP100 3", Ruger GP100 4"
NOTE: The option for the Basketweave Finish is now available. The picture is an example of the this fine craftmanship. 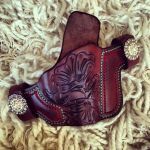 NOTE: The Swarovski Crystals Snaps Option is available for Custom Holsters from Soteria Leather. The picture is showing an 'example' of the Swarovski Crystals Snaps. 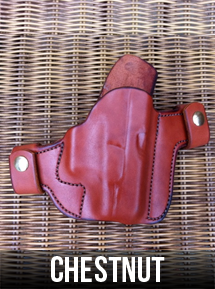 NOTE: The Coin & Metal Snaps Option is available for Custom Holsters from Soteria Leather. The picture is showing an 'example' of the Coin & Metal Snaps.